Guests of Sorobon Beach Resort know Jane well as she has lead successful yoga retreats on the premises in the past. Currently she also hosts regular yoga classes throughout the week for resort guests. 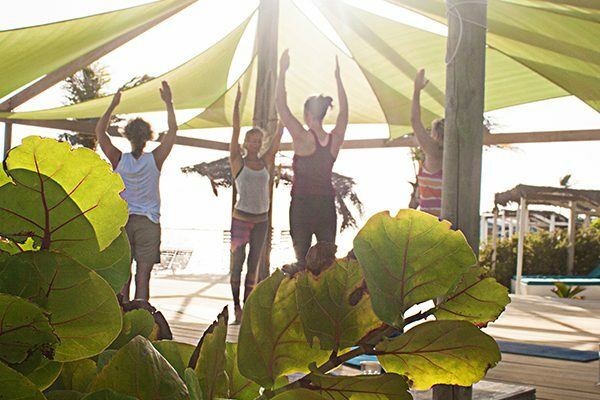 This wonderful 7 day yoga retreat in paradise will literally rebalance you. 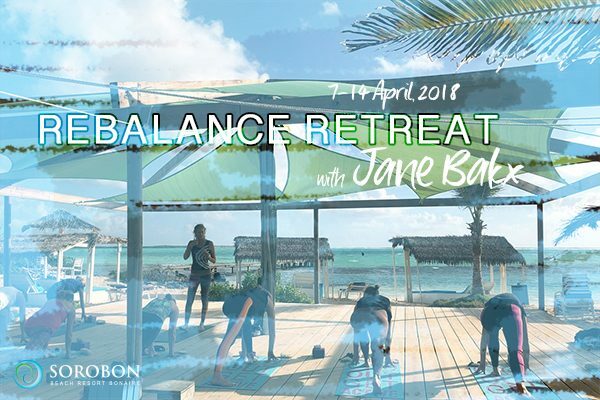 Jane will take you on a journey passed the 5 elements to rebalance your body and mind. You will be practicing yoga at the ocean and sleeping in a beautiful comfortable room next to it. The yoga sessions will make you connect to yourself, improve your flexibility and strength and make you relaxed and find inner peace all at the same time. You will also enjoy and benefit from the natural Halo therapy from the ocean. In your free time relax on the white sanded beach, swim, read, have a massage or spa treatment, reflect, surf, dive or explore the island. And eating delicious and healthy food throughout the whole week. Vegan, vegetarian and gluten free is available on request. The stunning surroundings of Sorobon and beautiful Lac Bai will make your heart sing. You really are in paradise. You can literally rebalance your body, mind and soul. Feeling more energy and recharged, feeling happier and strong, improving your body’s flexibility, strength and balance, getting healthier and beautiful glowing skin, reducing or relieving aches and pains in the body, improving your breathing, being able to relax more and sleep better, feeling calmer, dealing better with stress, feeling more focused and having a better concentration level. Learning to live healthier, living more in the moment and enjoying the little things in life. In the morning we offer dynamic Vinyasa slow flow classes (90 min). These classes start with a short meditation and then you flow from pose to pose moving with the breath, flowing through sun salutations, standing poses, seated practices, balancing postures and inversions. We believe in the importance of taking the time to feel your body during a flow class. Taking the time to get into the correct alignment for your body. Moving slow and with the breath helps you to connect to your body and to listen in, making sure you always respect your body’s boundaries. In the afternoon we offer Yin and Restorative yoga classes (75 min). This is a more passive practice, aiming to stretch the deeper laying connective tissues of the body and find full relaxation. The mostly seated and supine postures are generally hold for a few minutes. The focus on stillness of the body and mind can lead to a feeling of deep relaxation and a calm and clear mind. The classes are suitable for all levels. We move fairly slow and with control and take the time to get into the correct alignment, which also makes it possible to give various modifications to either deepen into more advanced variations of a pose or to take a step back. Whatever your body needs. And that is the great gift of yoga; connecting to yourself, listening in and really feeling what it is your body, mind and soul needs. The daily itinerary (Sunday to Friday) is a sample itinerary and timings may still change. Visit the website of Jane Bakx to read more about the instructor.